While carefully measuring the speed of rotation of galaxies, astronomers stumbled upon a profound cosmic mystery. They could estimate what the rotation speed should be by calculating the mass of all the visible stars and gas, thereby determining the gravity of the galaxy. Much to their surprise, the measurements showed that most galaxies are rotating faster than they should. Not a little faster. Much faster! More than twice as fast. 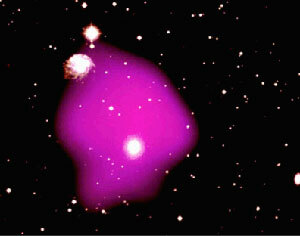 This meant that, according to Einstein's theory of gravity, these galaxies should be flying apart. Yet clearly, they are not. What can the answer be? Is it possible that most galaxies are surrounded by some "dark" form of matter that cannot be observed by radio, infrared, optical, ultraviolet, X-ray, or gamma-ray telescopes? Could Einstein's theory of gravity, which has proved to be correct in all cases so far, be somehow wrong? Sorry, I couldn't really say competent things about Dark Matter, but I just want to tell that I had a real great laugh here because of the similar Threads function offering a thread about Sandniggers. In addition there is the 'exotic' mix of particles, things made of combinations of other than simple Up and Down quarks, ( +2/3,-1/3) like strange or charmed quarks . I had no idea Einstein had a theory of gravitation. The only ones I have heard are Newton's and Dr. Hans Neiper's. "Centripital accelleration", sounds like a vortex to me and if this is right we should look to Viktor Schauberger. The real reason the mass estimations for the galaxy do not match the centrifual forces which one would counterbalance them is that gravity is not a pull or attraction, it is a push. Check Newton, he tells us how gravity works but not what it is. Nieper points out that matter shields gravity, absorbs it and converts it to other radiations (Bremsstrahlen), as well as plain old heat, as well as coverts some into matter. Dark matter is thus transmuted aether energy. It doesn't make sense to consider gravity as a push at first but when you think about it, there are very few ways to prove whether it is a push or pull. About the only way is when planets or heavenly bodies line up. One would think gravity increases along the line of the bodies but, in fact, it decreases along those lines. The mass of those bodies has absorbed some gravity which is really the same as aether energy. We all know Einstein opposed aether, no matter what concessions he may have made. Three generations of physicists have concerned themselves with proving Einstein right. This is why we are now in an energy dark age. If this is right then dark matter as well as aether should be in constant agitation (Zitterbewegnung). This hypothesis is testable if an example of dark matter could be found. I have read a lot about the possible mathematical flaws in special relativity. At the same time, I do think that the ether idea was laid to rest by the Michelson-Morley experiment of the late 19th century, as well as other experimental evidence and theoretical objections. Maybe some third paradigm is in order. Maybe the galaxies do not fall apart because some other 'sort' of 'gravity' holds them together, or perhaps we can only see the three dimensions of a galaxy, but, what if it exists in more than one 'reality', sort of like we're seeing a flag waving, but we're not aware of the wind. Von Braun, Michelson-Morley was designed on the premise that ether was matter (very fine matter in the ancient Greek sense). I believe ether is energy. Some others like Karl Schappeller as explained by Cyril Daves, explain ether as matter or energy, depending on the situation, somewhat like photons. Dr. Neiper sees ether as energy which is converted into other energies or matter as it strikes matter or is slowed down (Bremsestrahlen). Ether has made a big come back among alternative and cold fusion physicists.